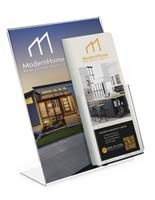 T-style designs display signage & brochures vertically. Stable countertop designs fit in tight spaces. 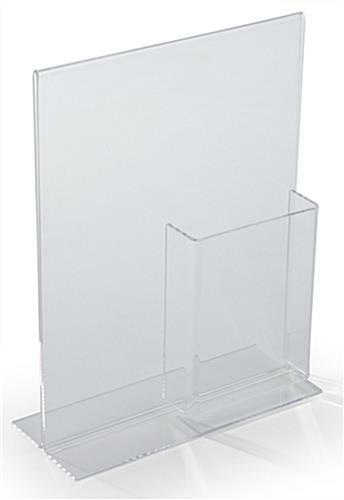 Acrylic assembly adds modern touch to all stores or offices. 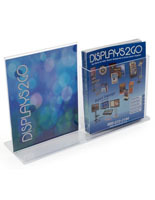 Are you shopping for an acrylic sign display that includes a frame along with a pocket for brochures? This versatile combination unit is like getting to fixtures for the price of one. 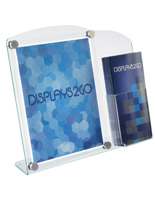 Each acrylic sign display, also known as a print frame is made with high quality materials. The literature holder is permanently attached to the lower right corner of the framing. 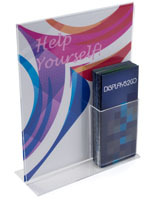 This signage holder is the perfect acrylic sign display one would want to use in a lobby or reception area. Print changes are simple with the bottom loading design. Flip the signage holder, acrylic sign display upside down and pull out the old graphics and slide in the new images. It is a simple process that can be done in seconds. 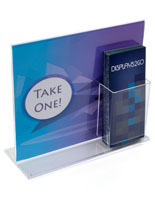 This acrylic sign display that holds an 8.5" x 11" graphic is ideal for use on a countertop or desktop in an office or business waiting room. This "T" style stand has a single literature pocket for 4" wide pamphlets. 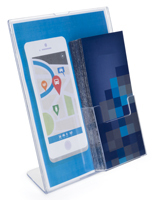 This acrylic sign display with a brochure pocket enables users to display vibrant graphics to entice passersby to take a brochure. The pocket is 1.25" deep by 5.5" high. 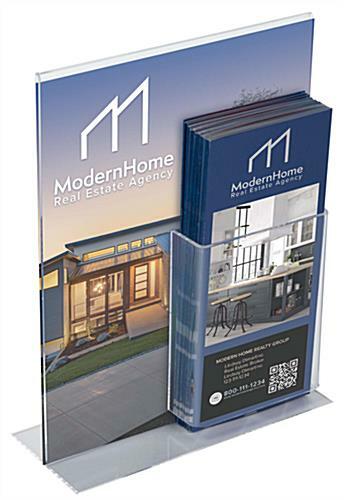 Each acrylic sign display is designed to hold a standard sheet of 8.5"w x 11"h paper, leaving a 4.25"w x 11"h unobstructed view of the signage to the left of the pocket. 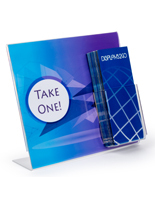 Place this countertop advertisement stand in a travel agency or hotel lobby to promote local points of interest or exotic destinations. 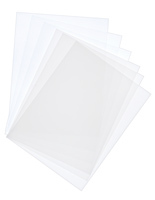 This acrylic sign display is also eligible for custom printing; see above for more details. These are great displays for our offices! Great quality and turn around time.